Unbounded Analytics™ of browser requests automatically correlated to microservice performance. Every end user request is correlated with backend server-side traces so you can immediately identify the root cause of any poor performing request regardless of whether it’s on the browser or server side. Collect user id’s, email addresses, and usernames so that you can see all activity in chronological order for any user and uncover the exact path that led to the issue. Every request from every user correlated from browser to server for immediate root cause identification. 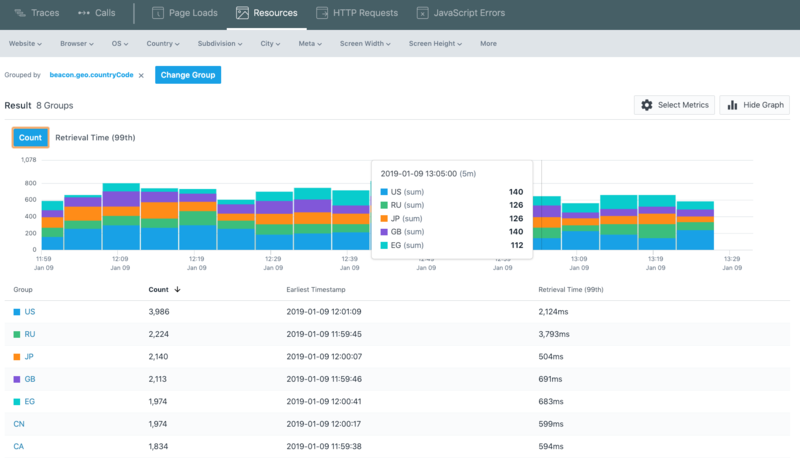 The most powerful application performance analytics ever – optimize code from the frontend browser to the backend server. Achieve a new level of customer satisfaction – instantly know when problems happen on the browser, in the App or the data center. All requests are analyzed in real time to populate curated EUM dashboards making it easy to identify poor performance, errors, and their root cause. Enrich the default EUM data with metadata tags to extend Instana’s exceptional filtering and grouping capabilities. Capture every browser request, in profound detail, to understand exactly what your customer is experiencing. Familiar with “Developer Tools”? Instana historically records the same type of information for every user request so the actual end user network troubleshooting data is always available.